We've made some updates to the Colorado Sales Tax Report in your TaxJar account to match the state's new guidelines regarding destination based collection. These changes (outlined below) will make it easy to report sales by destination when you file! The first big change in that the Retailer's Use Tax section is no longer displayed in 2019 Reports. After the state's update to destination collection, all Sellers with nexus in Colorado (physical, economic, or otherwise) are required to have a Sales Tax account and collect sales tax on ALL taxable sales. As as result, Retailer's Use Tax accounts will only be applicable to sellers who do not have nexus in Colorado (physical, economic, or otherwise) who wish to collect and remit tax in this state despite having no obligation to do so. For this reason, our Colorado Report for sales after January 1, 2019 and later assumes that you have a Sales Tax account and are required to report sales by destination when you file. With destination sourcing, all sellers will collect sales based on the buyer's jurisdiction and file a sales tax return for each location where you made sales during the filing period. Because this Report is based on destination sourcing, you will not need to enter a nexus address in your Colorado State Settings. 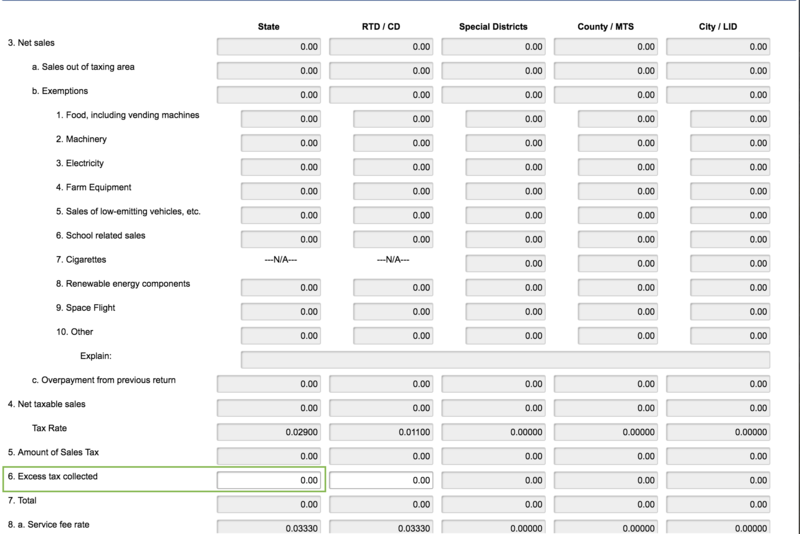 Sales tax return details are nested in the row for each location. Sellers are required to register a Non-Physical Location or Site for each location where they made sales during the filing period because the state requires a sales tax report for each individual location. 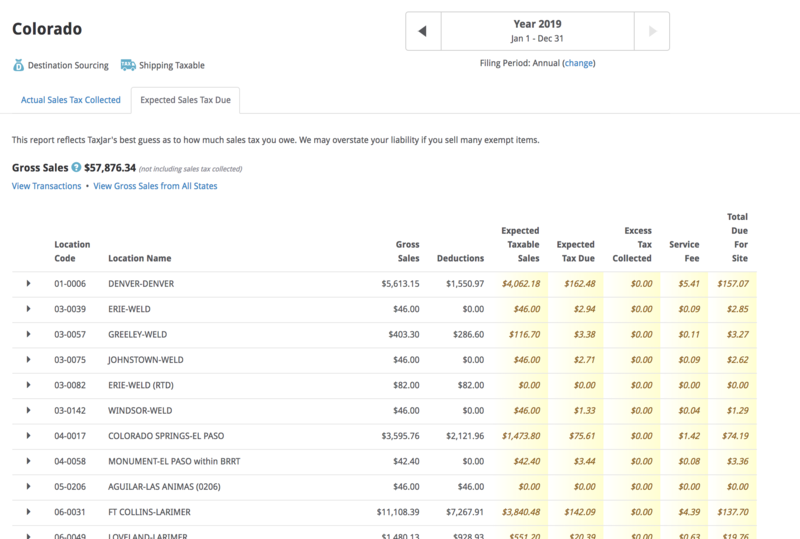 If you click the arrow at the far left end of the row, the Report will expand to display an additional breakdown of all the details you'll need for each Non-Physical Location where you made sales. You'll also see RTD/CD row for each jurisdiction once the jurisdiction row in the Report is expanded. We also added a total for “Total Due for All Sites” row which is a sum of “Total Due for Site” for all locations. Deductions, such as services or sales to resellers/wholesalers or government entities are exempt statewide, so those are called out in the top section of the Report for state taxes. Other types of exemptions, such as Food and Groceries, which can vary from jurisdiction to jurisdiction are listed in the Exemptions column in the individual jurisdiction breakdowns. We also now include an estimate of Excess Tax Collected in the Expected Report. 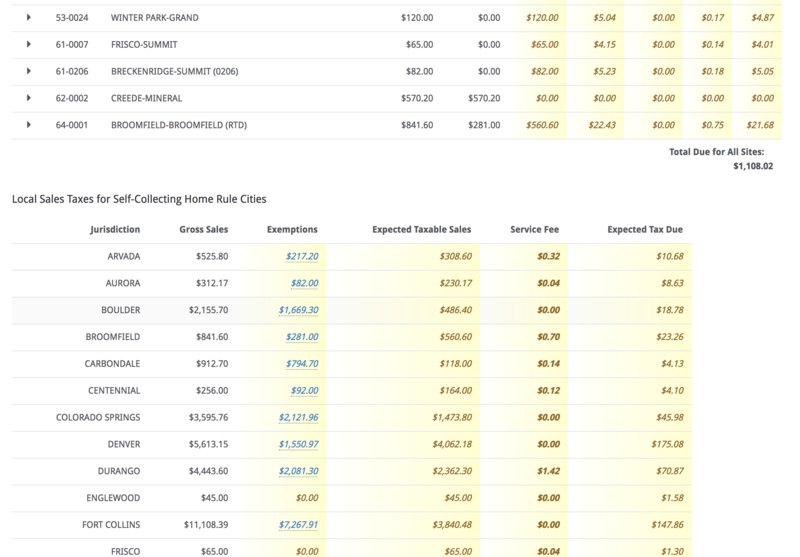 If you made sales to the Self-Collecting Home Rule Cities, you'll see those listed separately in the "Local Sales Taxes for Self collecting Home Rule Cities" section of the Report. We've added a total for “Total Due for All Home Rule Cities” row which is the total of Expected Tax Due Amounts for all Home Rule cities. Please note: Sales for the Self-Collecting Home Rule cities must be filed separately and cannot be reported in the State Sales Tax Return. As we mention here, if you are enrolled in TaxJar's AutoFile for Colorado, our system will submit a Destination based Sales Tax Return for state administered cities, counties and districts for sales made 1/1/19 and later. TaxJar will NOT AutoFile sales tax returns for Colorado’s Self-Collecting Home Rule Cities. If you need to file returns for Home Rule cities, you will be responsible for submitting those returns and payments separately. Please note that Colorado has a few location codes that have multiple taxing jurisdiction requirements. The TaxJar Report for Colorado combines these locations into a line with multiple RTD/CD and/or City/LID items. When reporting these locations to the state there may be some small differences in the sales tax calculated due to the combined locations. AURORA-ARAPAHOE unincorporated Arapahoe County including special districts RTD and CD. This location is listed as 10-0206 AURORA-ARAPAHOE (0206) / BENNETT-ARAPAHOE (0206) in the CO Report. Report the “gross sales” to AURORA-ARAPAHOE (0206) on the Colorado Revenue Online. This location is listed as 11-0206 COAL CREEK C.-JEFFERSON (0206) / LITTLETON-JEFFERSON (0206) in the CO Report. Report the “gross sales” to LITTLETON-JEFFERSON (0206) on the Colorado Revenue Online. This location is listed as 12-0206 AURORA-ADAMS (0206) / BENNETT-ADAMS (0206) in the CO Report. Report the “gross sales” to AURORA-ADAMS (0206) on the Colorado Revenue Online.